“Java Software Critical Update” is the PUP that uses misleading techniques to prevent removal. Use Reimage to locate malicious components and get rid of them faster than with uninstall instructions. A full system scan blocks virus reappearance and prevents traffic to malicious domains. How can "Java Software Critical Update" virus infiltrate my computer? How to remove "Java Software Critical Update" virus? “Java Software Critical Update” virus is an adware-type application that may initiate serious havoc on your computer. No matter how trustworthy-looking ads it displays, all what it seeks is to make you install questionable programs on the system. 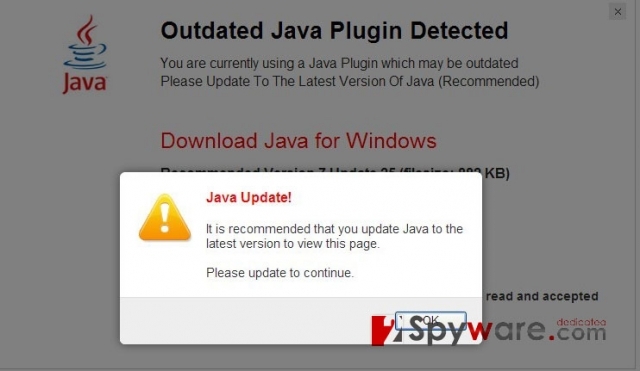 By reporting about outdated Java, “Java Software Critical Update” pop-up alert seeks to trick people into clicking on “Download” or “Click to install now” buttons and installing programs that belong to 'adware', 'browser hijacker' and similar categories. If you think that your Java is outdated, go to its official website and download this update. Please, stay away from “Java Software Critical Update” popup because it has nothing to do with this application. How can “Java Software Critical Update” virus infiltrate my computer? WARNING: Your Current Java Is Outdated! It is recommended that you update Java to the latest version to view this page. How to remove “Java Software Critical Update” virus? Scan your computer with Reimage or Malwarebytes MalwarebytesCombo Cleaner and remove dangerous files. Here, look for LyricsSay-1, LyricXeeker, Plus-HD 1.3, BetterSurf, LyricsGet, DownloadTerms 1.0, LyricsBuddy-1, AlLyrics, ElectroLyrics-1, a2zLyrics-1, Feven 1.7 and other unknown entries. Open Internet Explorer, click the Gear icon or ‘Tools‘ → 'Internet Options'. Go to the 'Reset Internet Explorer settings' → 'Delete personal settings' and click on 'Reset' option. Open Mozilla Firefox, go to the 'Help' section → 'Troubleshooting Information'. This entry was posted on 2014-05-28 at 08:02 and is filed under Adware, Viruses. You can quickly scan the QR code with your mobile device and have “Java Software Critical Update” virus manual removal instructions right in your pocket. How did you remove “Java Software Critical Update” virus?